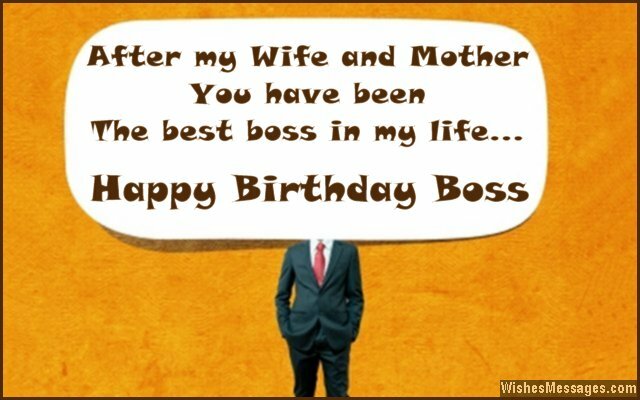 Birthday Wishes for Boss: Your boss’ birthday is an opportunity to lighten up the mood at your office. From funny quotes about annoying bosses to humorous messages – write something sweet on a card. This is also your chance to say thank you by subtly weaving in a sense of gratitude in your greeting. Read it out aloud as you raise a toast to your manager in front of all your colleagues. If you’re a close knit group at work, post cute stuff on your Facebook and Pinterest. Cake, food and after work drinks – birthdays are when you can forget office rivalry and just celebrate, just like how an awesome team should. 1) Success and happiness is what I wish you on your birthday. If you feel like doing something nice in return, you may increase my pay. Happy birthday boss. 2) #MondayMotivation trends on Twitter because of inspiring bosses like you. Happy birthday. 3) Since you have always led us in the right direction when it comes to work, today we will lead you in the right direction towards the pub. Happy birthday boss. 4) A boss like you and an employee like me, we make a smashing team don’t you see? Happy birthday. 5) Boss, this birthday promotes you to a new year in life without any extra benefits or rights. Welcome to our world, that’s exactly how we feel when we do more work without getting a raise. Happy birthday. 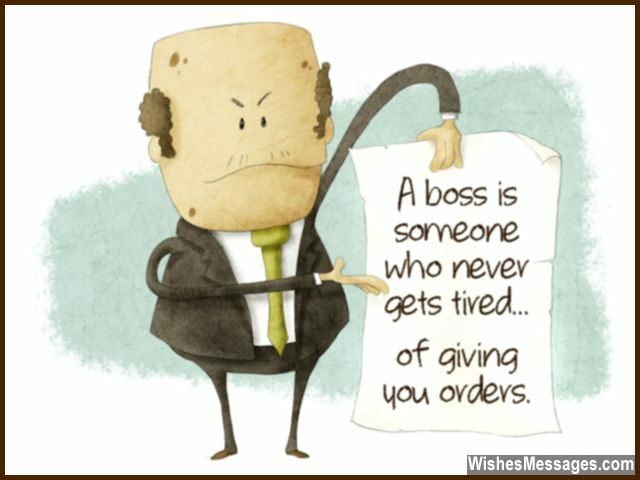 6) A boss is someone who never gets tired, of giving you orders. Happy birthday to one such guy. 7) Your birthday is a gentle reminder to all of us that even a boss as tough as you, is a human being after all. Happy birthday. 8) Every year, your birthday comes on the same day at the same time. It seems to be extremely punctual just like you. Happy birthday. 9) If you weren’t our boss, we would all be at a big loss. Without your decisions and direction, there is no way we would be able to function. You are the reason we have come such a long way, and we are the reason why you are going to have an awesome birthday. Happy birthday boss. 10) You can officially expect us to stop hating you for one day, just because it is your birthday today. Have a good one boss. 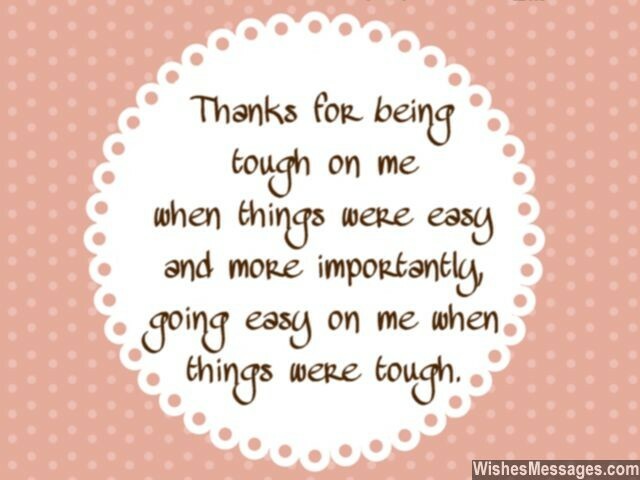 11) Thanks for being tough on me when things were easy and more importantly, going easy on me when things were tough. Happy birthday boss. 12) Promotions and success, peace of mind and happiness. Titles and awards, achievements and records. All this is what, I hope you get a lot. Happy birthday. 13) Just three simple words are what I would write in a recommendation for you, if I had to give you one – Best Boss Ever. Happy birthday. 14) Today is one of those rare days when we will actually listen to everything you say and do everything you ask us to. After all, it is your birthday, isn’t it too? Happy birthday boss. 15) In having a boss like you I take a lot of pride, and working with you has been one awesome joyride. Happy birthday. 16) You are worthy of, respect and admiration. Always full of, energy and motivation. In tough times, you’ve cut us some slack. A boss, we know you’ve always got out backs. Happy birthday. 17) Always having sky high expectation is a trait of yours that we sometimes hate, but unfailingly giving us a sea of support is a trait of yours that we always love. Happy birthday boss. 18) All work and no play may be your only motto, but today is your birthday so you will have to let go. Cancel all your meetings and leave from office early, so we can all go out and have a massive party. Happy birthday boss. 19) Even throwing you a party is a tough job because it is difficult to impress a boss who has such high expectations in everything. Happy birthday. 20) Friends who become bosses are rare. But bosses who become friends are rarer. Happy birthday to one such awesome boss. 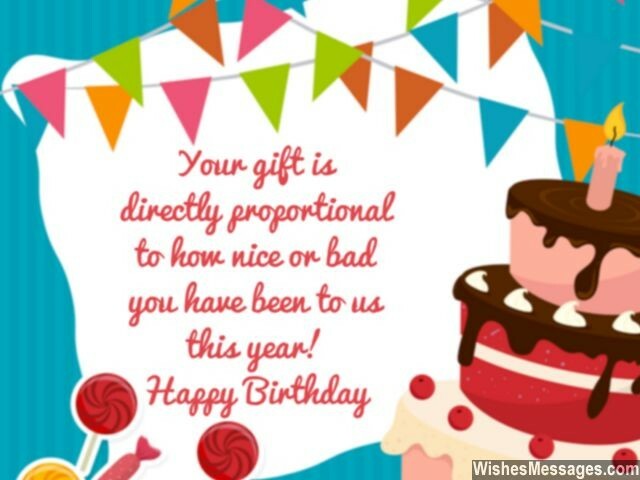 21) Your gift is directly proportional to how nice or bad you have been to us this year. Happy birthday boss. 22) The biggest compliment I can give you on your birthday is that I wouldn’t exchange you as my boss for anything else in this world. Happy birthday chief. 23) In a battle between company targets and employee happiness, we think you’ve struck a fine balance. Happy birthday boss. 24) There is only one reason why working with you has been so easy. It is because you always know how to bring out the best in me. Happy birthday boss. 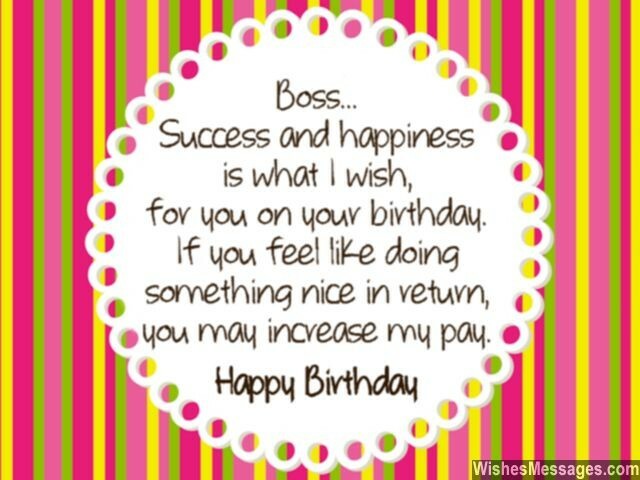 25) Please don’t treat this as just another birthday note from an employee. My wishes are as true and genuine as the contribution that you have made in my career and life. Happy birthday. 26) After my wife and mother, you have been the best boss in my life. Happy birthday. 27) Anyone can become a boss but very few managers have the qualities of a leader like you. Happy birthday. 28) We hate you when seemingly impossible targets are set, but we love you when our mistakes, you conveniently forget. We hate you when we are asked to stay back late, but we love you when you treat us like your mates. Boss, happy birthday. 29) Beneath all your anger and frustration, we know you only mean well for us and the team. Happy birthday. 30) If all the bosses in the world were as cool as you, all the employees in the world would be as happy as us. Happy birthday captain cool. 31) Most bosses are preachers, but you are a true leader. Most bosses are just managers, but you also a mentor. Most bosses arrogantly demand respect, but you deserve it because you are perfect. Happy birthday boss. 32) Boss, we all wish that life brings you a new year full of happiness and perks. Having said that, we hope your birthday calls for a day off from work. Happy birthday. 33) Wishing a perfect birthday to the perfect boss who always demands perfection. May you have a perfect party and a perfect year ahead. 34) May the year ahead be very productive, dynamic and illustrious for your career. But most importantly, may it also help you spend time with everyone, near and dear. Happy birthday boss. 35) The happier you are, the better for us. So happy birthday boss. 36) Bosses are supposed to be mean and heartless. How did you turn out to be kind and selfless? Happy birthday. 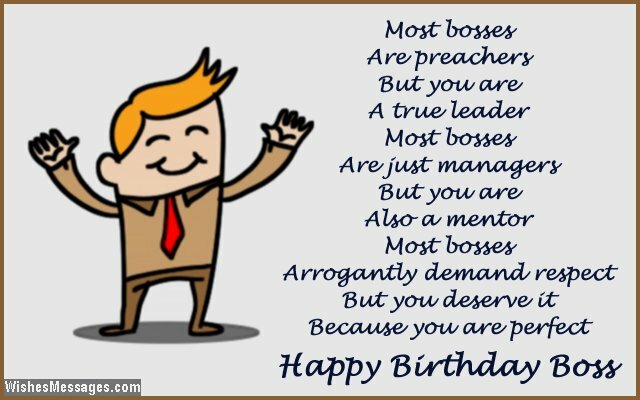 37) Boss, for a day we’ll be giving the orders around here and our first one is to you – have an awesome birthday. 38) Sometimes you show us tough love with a straight face, sometimes you shower us with compliments and praise. There’s never a dull moment when you are around. Whenever you are, your ears are always on the ground. 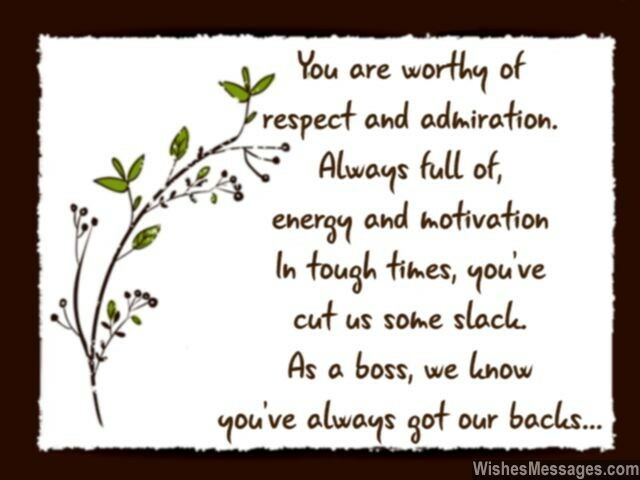 Bosses like you are really hard to come by, we are lucky to be under your watchful eyes. Happy birthday. 39) Boss, here’s your task list for the day – cut the cake, open the gifts and party the day away. Happy birthday. 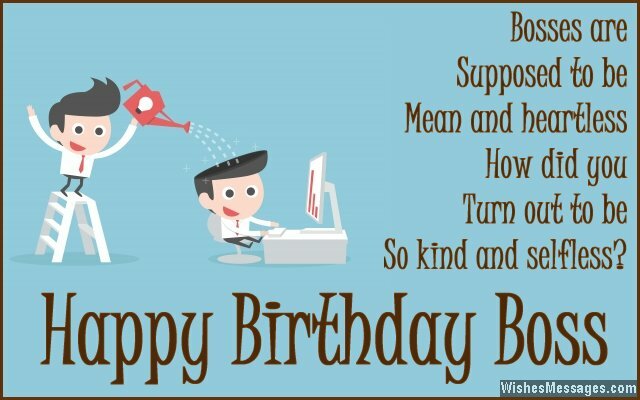 40) May your birthday turn out to be as perfect, neat, calm, level headed, charming and impeccable as you are. Happy birthday.